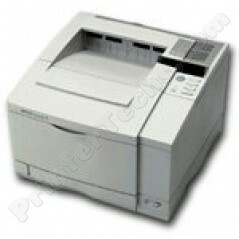 The HP LaserJet 5M is a workhorse medium sized PC/Mac compatible printer. It includes an HP JetDirect card. 12 pages per minute, 250-sheet paper tray. The HP LaserJet 5M is a workhorse medium sized PC/Mac compatible printer. (The 'M' stands for Multi-environment -- it's Macintosh Compatible) It includes an HP JetDirect card. You get a lot of bang for your buck, truly an excellent value. The LaserJet 5 series printers have a long track record and have proven to be extremely reliable. We would much rather own one of these than one of the newer "disposable" personal laser printers (a.k.a. toasters). It's really is hard to find a more reliable mid-sized laser printer. Original HP List price: $1985. These are built to last! 11.8" x 17.4" x 16"